Who can Attend this Program ? Entrepreneurs who are looking to Scale up Exponentially yet Systematically! CXOs who are Passionate to Learn New Trends & Practical Insights to Implement in Business. The insights and knowledge shared are coming to you from a rich R&D of 15+ Years and a wide Exposure of Coaching 125+ Categories and Segments of Companies across different Countries! 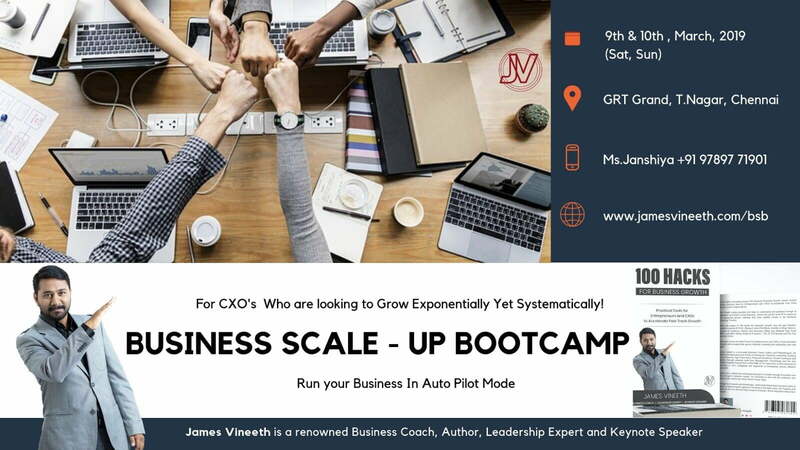 The Business Scale-Up Bootcamp is aimed at Empowering CXOs and Businesses and thus Contribute for Nation Building. Therefore the Pricing systems are designed in a way more CXOs can benefit by attending Individually or Collectively and Transform their Organization. I have attended a workshop conducted by Mr.James Vineeth. Right after the session I was heading a regional meeting in our company and I was already realising the benefits from the workshop in terms of delivering and conducting the meeting with utmost clarity of thoughts and speech. Mr.James is such a motivation and a powerful influence in his trainings. I strongly believe that he would be a valuable training partner for any Organization. If you would like to Speak to us before Registering, Kindly fill the form below.